Most ambitious people believe that reaching the peaks of success means being on 24/7—tirelessly networking, deal-making, and keynoting conferences. This is nonsense, says Morra Aarons-Mele. As an eminent entrepreneur with a flourishing business and a self-proclaimed introvert with lots of anxieties, Morra disagrees with the notion that there’s only one successful "type": the intense, super social, sleep-deprived mover and shaker, the person who musters endless amounts of "grit." Hiding in the Bathroom is her antidote for everyone who is fed up with feeling like they must always "lean in"—who prefer those moments of hiding in the bathroom to constantly climbing the ladder or working the room. Morra knows what it takes to make your mark, and now, this entrepreneur who has boosted the online strategy of clients such as the Malala Fund, President Obama, the UN Foundation, and the Bill and Melinda Gates Foundation shares the insights, tricks, and knowledge she’s learned. 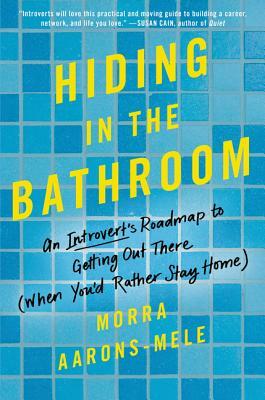 Filled with advice, exercises to help readers evaluate their own work/life fit and manage anxiety, valuable tools, and stories of countless successful people—entrepreneurs, academics, and novices just beginning their careers—Hiding in the Bathroom empowers professionals of all ages and levels to take control and build their own versions of success. Thoughtful and practical, it is a must-have handbook for building a fantastic, prosperous career and a balanced, happy life—on your own terms. — Lisa Stone, cofounder and CEO emeritus, BlogHer Inc.